Spring has finally sprung, officially. We may be waiting for the weather to catch up to the date on the calendar but I am in full spring mode. I am so ready for warm weather, flowers, and Easter. Because Easter means Easter candy. And, oh yes, I am so ready for it all- peanut butter eggs, jelly beans. Bring them on! As much as I love those treats, sometimes I want something more adult that still feels seasonal. A candy I could easily serve to company or end a special meal with. I can’t have guests show up and put out a tray of jellybeans and call it a day. That’s not my style. I like to make my company and my spring celebrations feel extra special. 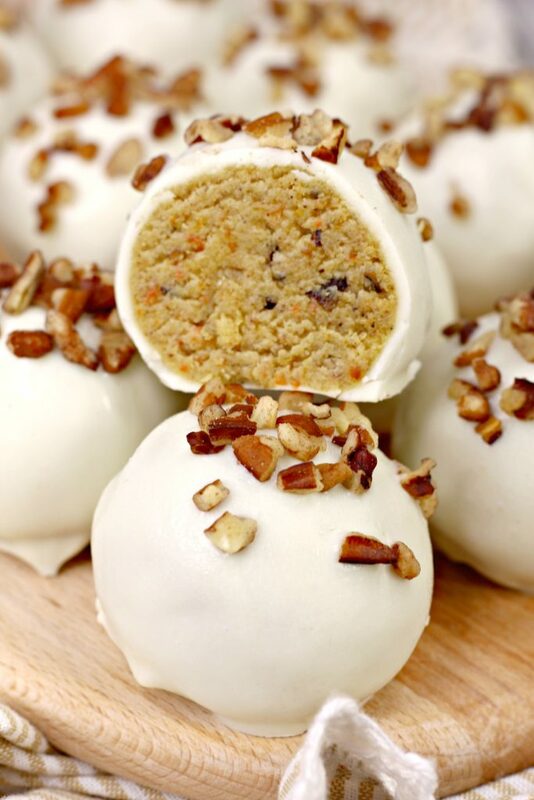 That’s where these carrot cake truffles come in. And they are so special. Imagine rich, sweet, slightly spicy carrot cake. And make it denser and even more moist than regular carrot cake. That is how the cake part of these truffles are. Have you ever had a cake pop? You know how creamy the cake in a cake pop is? 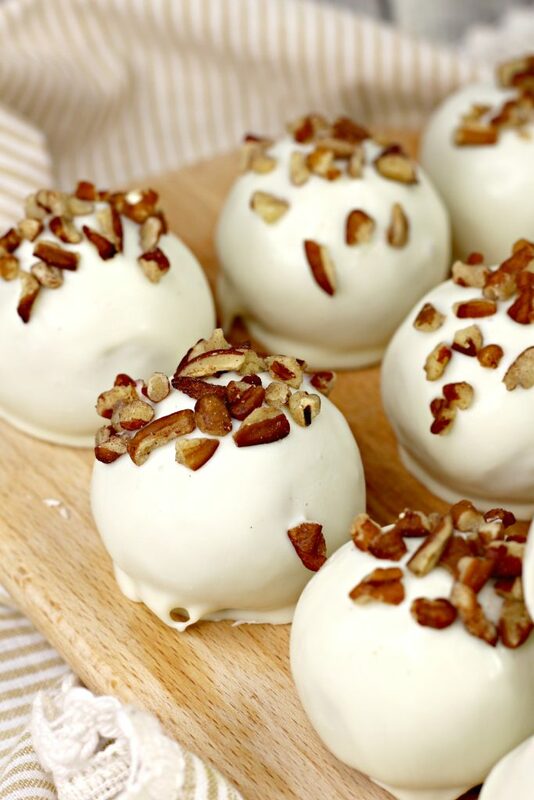 That’s how these carrot cake truffles are. 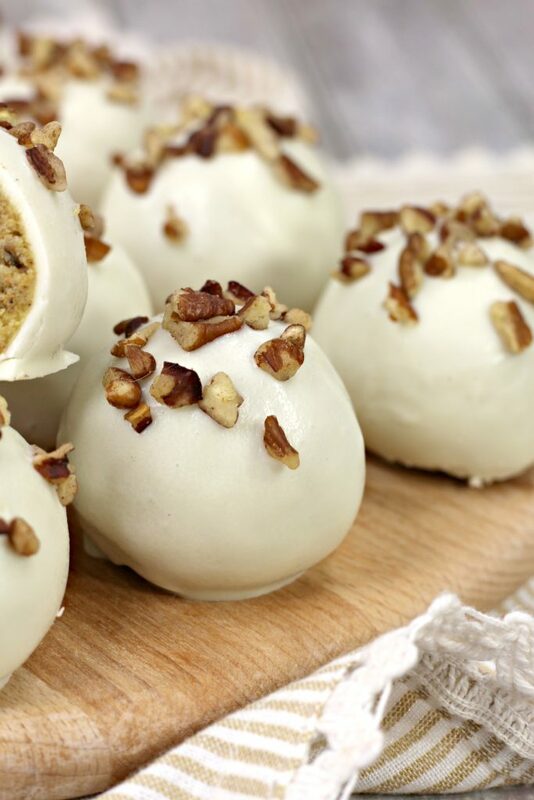 Making these carrot cake truffles is a bit of a process, but if we break it down it’s not hard. The first step? Making the cake. There’s no special technique just because the cake creates the base for the truffle filling. Begin by creaming together your sugar, oil, and eggs. Then mix in your dry ingredients. When the dry ingredients are incorporated, fold in the shredded carrots and pecans. Then pour the batter into a 9×13 baking dish and bake it for 30 to 40 minutes. There’s no need to worry about how the cake looks when it comes out of the oven because once it cools, you’re going to crumble up the cake. 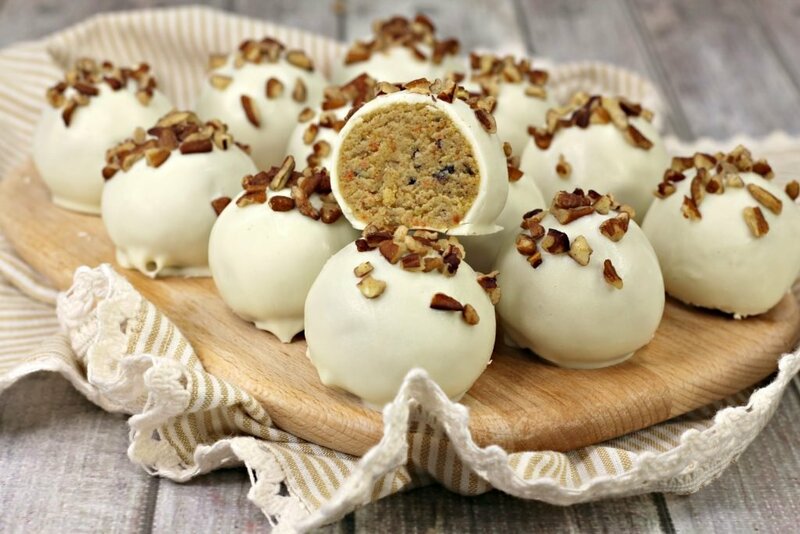 Then you mix the crumbled cake with cream cheese frosting to create the rich, creamy consistency of the carrot cake truffle filling. You’ll know you’ve added enough icing because the crumbles will stick together and form a dough that’s similar in consistency to cookie dough. When the dough forms, use your hands to roll little balls. 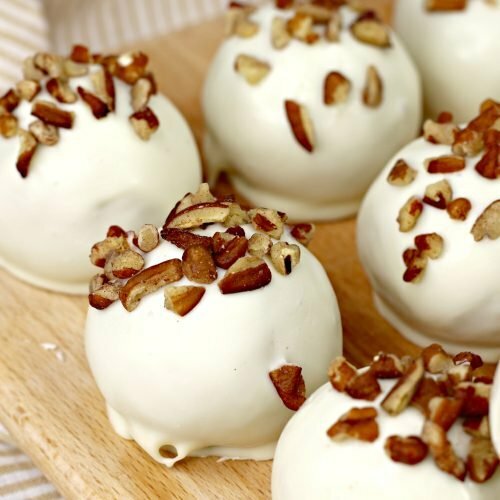 Let the little balls set in the fridge for an hour and then dip them into melted white chocolate and top with chopped pecans. Let the chocolate set before serving. The end result? 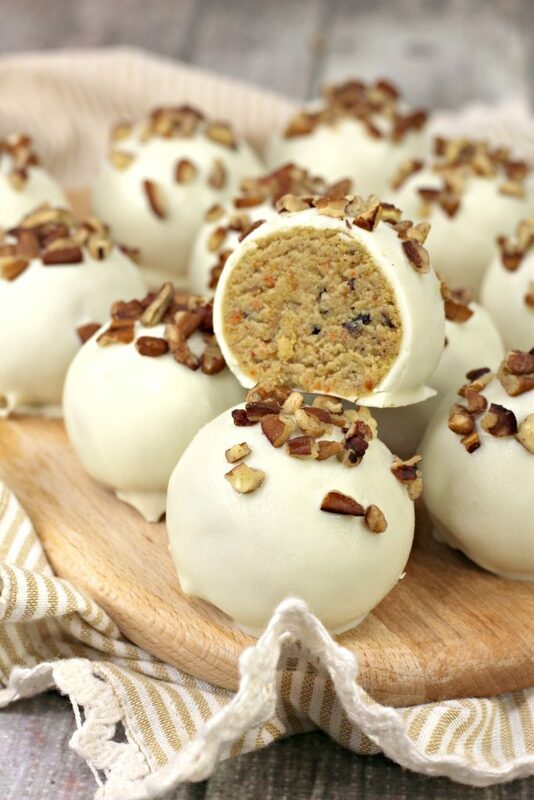 An impressive carrot cake truffle with a sweet, slightly spicy carrot cake center sure to wow everyone this spring. Allow the chocolate to harden for 15 minutes before enjoying! Wow, who wants a basket full of Easter eggs, when you can have a basket full of Carrot Cake Truffles?? These look so delicious! Thanks so much for sharing this with us at Fiesta Friday this week! Awesome!